Join members of The Dinner Party Curriculum Team to explore and experience the rich content of the iconic artwork, The Dinner Party, now permanently installed at the Brooklyn Museum. Engage in inquiry-based activities to deepen understanding of The Dinner Party while exploring ideas, activities, and lessons for use in K-12 teaching. Experience a private viewing of The Dinner Party on site at the Elizabeth A. Sackler Center for Feminist Art at The Brooklyn Museum. A highlight of this trip will be to meet with original members of the team who worked with Judy Chicago on the creation of The Dinner Party. STUDY INSTITUTE PROGRAM: We begin with an organizational meeting and dinner on Monday, July 18 from 3:00-8:00 p.m. Daily sessions begin at 8:30 a.m. and conclude at 5:00 p.m., with the exception of Thursday, July 21, when we travel to the Brooklyn Museum and return around 10 p.m. The Institute will meet in Sharadin 113. Please note that the Institute is strictly limited to 30 participants. 9:00	Morning Shorts. Where Have We Been? Where Are We Going? 9:30	Morning Shorts. Where Have We Been? Where Are We Going? 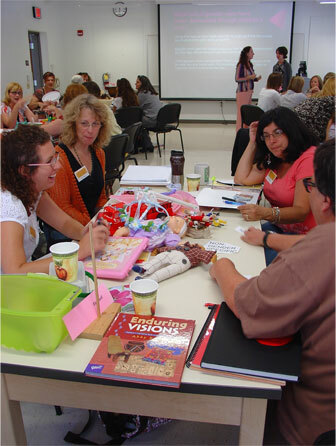 Cheri Ehrlich, Senior Museum Educator from the Brooklyn Museum of Art, CJ, Roni and Barbara discuss how gender roles have been delineated through children’s toys. 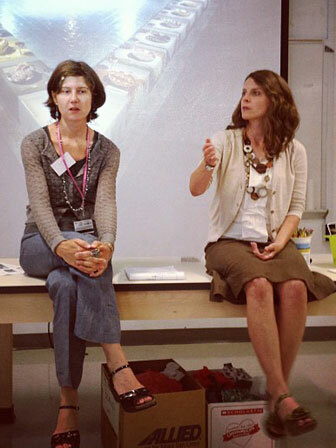 Amy Pfeiler-Wunder and Nicole Romanski take particpants through Encounter 2: Extending the Invitation.